I've been away for the weekend on a papercraft workshop organised by the Card Fairy craft shop. 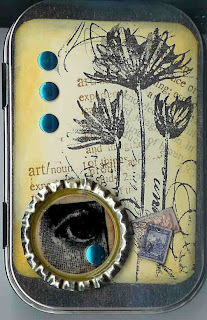 90 of us stayed at a hotel in Oxford and had 8 workshops over two days with excellent tutors including Claire Hampton, Michele Charles, Leandra Franich, the Art Girlz and Tim Holtz. 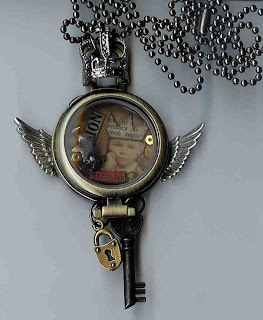 All the projects we worked on were very different and included ATCs, a fairy doll, a tag book, an altered tin and a magnificant pendant. The whole weekend was really well organised, lots of people put in a lot of hard work to make it happen and it was thoroughly enjoyable. I've never had the opportunity before to spend that much time in concentrated crafting and there was no need to stop and do cooking, washing etc - wonderful! The workshops were an hour and a half each so they were quite intense and I didn't completely finish most of the projects. However I did enough, and brought home enough bits and pieces that I can finish them off back home and as I do so and get organised I will post some pictures. 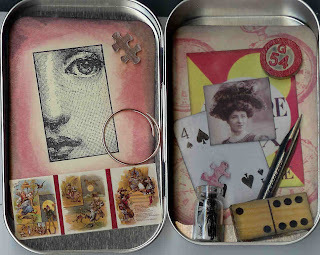 I did complete this tin and I intend to give it to a friend for her birthday on Sunday so here's a picture before it goes! Thanks to Claire Hampton for this project. 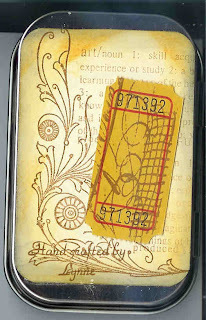 And here is the pendant we made with Tim Holtz, similar to designs in his Distressables book and it had never occurred to me that I might be able to make something like that myself.